Sound. An alteration of pressure that propagates through an elastic medium such as air which produces an auditory sensation. 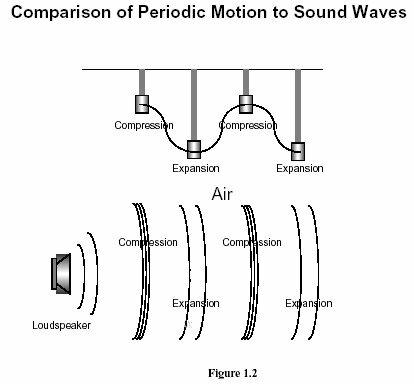 Sound travels in a wave motion through the air to our ears. An effective tool to demonstrate wave motion is a weight hanging from a spring. Picture the following diagram as a single weight and spring combination varying as time progresses along the horizontal axis. In Figure 1.1, the first position of the weight on the spring is at rest with no forces exerted upon the system. 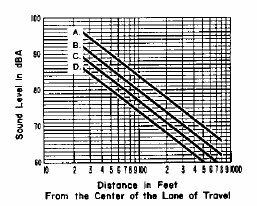 If the weight is raised above its point of rest and the progression of the weight moving down and up again is observed over a period of time, a sinusoidal wave form is produced. 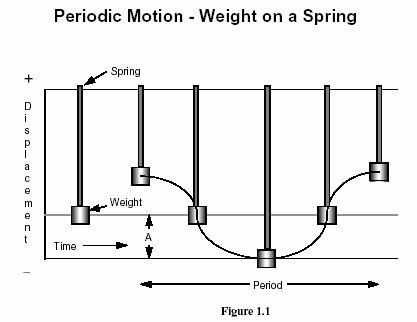 This example demonstrates the relationship between a linear motion, the weight bouncing on the spring, and its corresponding wave form. The Amplitude of the moving weight is denoted as A on the diagram and corresponds with the maximum displacement of the weight from its "at rest" position, or the peak of the wave form in the positive or negative direction. The Period of the vibration is the amount of time taken to produce one complete cycle. The number of cycles per second defines the Frequency of the periodic motion which is denoted by the unit of Hertz, abbreviated as "Hz". The graphical representation of sounds in Figure 1.2 are Pure Tones, which are sounds made up of a single frequency. A familiar example of a pure tone is the sound produced when a single key of a piano is pressed. For instance, the middle C key on a piano vibrates the associated wire at a rate of approximately 260 times per second or 260 Hertz. The vibration of the wire transfers its motion to the sound board of the piano, which then vibrates at the same frequency, causing the air adjacent to the sound board to form compression and expansion waves in the air emitting outward from the sound board. When received by the human ear, this is regarded as sound. Most sounds are not pure tones but a mixture of tones of varying amplitude, frequency, and duration. The intensity of sound waves produce a sound pressure level, which is commonly measured in a unit called the Decibel. The decibel is a logarithmic measurement used to accommodate a numbering scheme that encompasses a large range of values. The logarithm is used because the human ear can detect sounds more than a million times quieter than a jet aircraft during take off. Decibel = The ratio between two quantities that are proportional to power. The commonly used unit for measuring sound pressure levels. Many different properties affect the noise level of a specific source type. For example, three lawn mowers may have three different noise levels because of differences in each specific piece of equipment. Noise level also depends on the distance from the noise source and the attenuation of the surrounding environment. 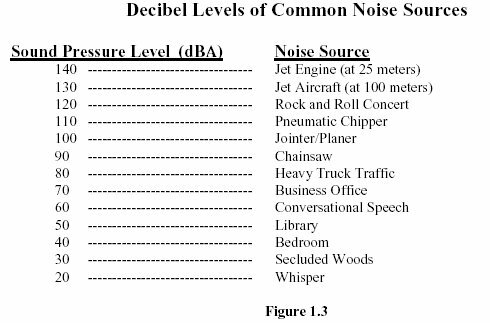 Figure 1.3 provides a rough estimate of decibel levels of some common noise sources. Addition and subtraction of decibels is often necessary for estimating total noise levels or background noise. Because decibels are measured using a logarithmic scale, conventional linear mathematics can not be used. The most convenient way to perform simple arithmetic functions involving logarithmic measurements is to use doubling rules. These rules provide an accurate estimate of the effect distance and multiple sources have on measured sound pressure level. When the distance is doubled from a Line source the sound level decreases three decibels. 64 decibels at 200 feet. When the distance is doubled from a Point source the sound level decreases six decibels. 83 decibels at 200 feet. In many situations pertaining to noise control and monitoring, it is very useful to be able to add and subtract noise levels. A doubling of sound energy yields an increase of three decibels. It is important to note the characteristics of logarithmic addition or subtraction of decibel levels. Measurements must not be in sustained winds or in precipitation which results in a difference of less than ten decibels between the background noise level and the noise source being measured. 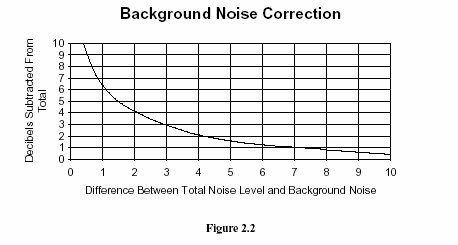 Figure 2.2 is a graph used to estimate the amount of background noise influencing a measurement, and the corresponding decibel level to be subtracted from the total measurement to determine the decibel level of the noise source being monitored. 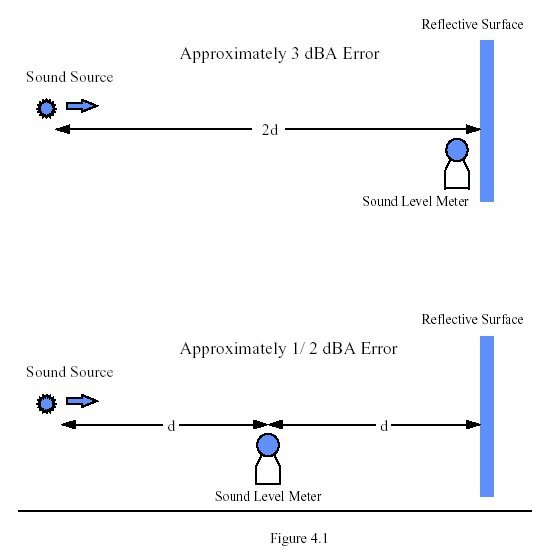 Figure 2.2 is useful in calculating the effect background noise has on the total noise level being monitored. The background noise must be more than ten decibels below the noise level of the source being monitored to have confidence in the accuracy of the measurement. In certain instances, when a single noise source is analyzed along with other noise sources, Figure 2.2 can be used to isolate the noise source being monitored and calculate its individual noise level. This is done by measuring and recording the total noise level of all sources. Next, the noise source to be isolated is turned off and a noise level reading is taken with all the other existing noise sources in operation. Total noise level is then subtracted from the background noise level. 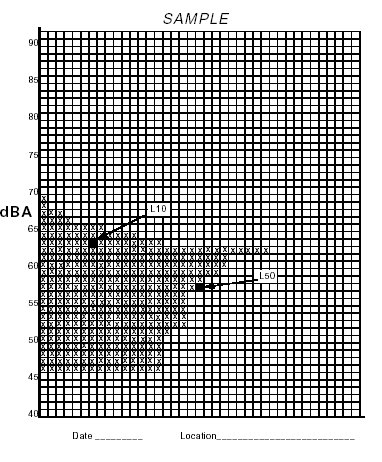 If, for example, the total noise level is 84 dBA, then falls to 80 dBA when the isolated source is turned off, Figure 2.2 can be used to attribute an 82 dBA noise level to that source in the absence of background noise. The threshold of perception of the human ear is approximately three decibels, and a five-decibel change is considered to be clearly noticeable to the ear. This is primarily due to the logarithmic measuring metric typically associated with decibels. 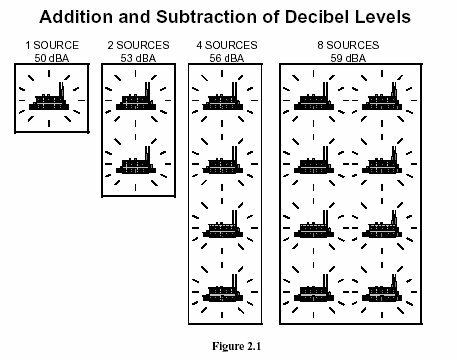 As Figure 3.1 demonstrates, a 10-decibel change would be perceived to be twice as loud. Weighting networks are used in noise monitors to attenuate specific frequencies in the audio spectrum to attempt to duplicate the response of the human ear. 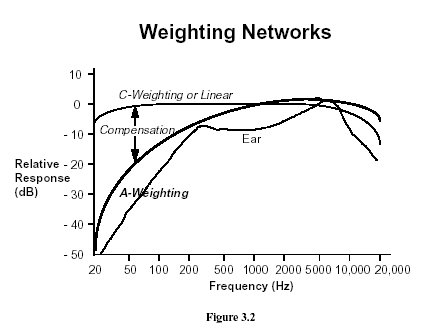 The graph in Figure 3.2 represents the compensation of a C-weighting network, A-weighting network and the sensitivity of the ear. This illustration is useful in understanding how the ear is inefficient in the detection of lower frequencies and is very sensitive to higher frequencies. The C-weighting network is a linear network that does not noticeably vary in its amount of compensation throughout the audio spectrum. For this reason the C-weighting network represents the actual sound pressure level that is received by the sound level meter. C-weighting is used during the calibration of sound level meters to insure that the sound level displayed on the meter is invariant of the frequency of the calibrator. The human ear can not detect or "hear" lower frequencies as well as higher frequencies. The A-weighting network is used to duplicate the sensitivity of the human ear. At 100 Hertz, the A-weighting network filters out approximately 20 dB from the incoming signal before it is combined with the levels from the other frequency ranges to produce an A-weighted sound level. On the A-weighting scale, at 1000 Hertz, nothing is subtracted. When noise measurements are performed, an important part of site selection is the consideration of errors caused by reflecting objects. 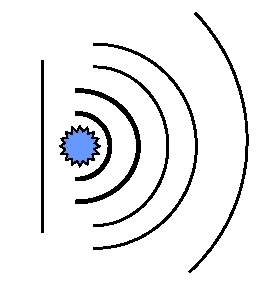 Figure 4.1 shows the effect on noise measurements of a reflective object such as a wall. The following test procedure has been approved by the Executive Director of the Minnesota Pollution Control Agency for the measurement of non-impulsive noise. Temperature and/or humidity conditions must be within the equipment manufacturer's specifications. Measurements must be made at least three feet off the ground and away from natural or manmade structures which would prevent an accurate measurement (barriers, houses). 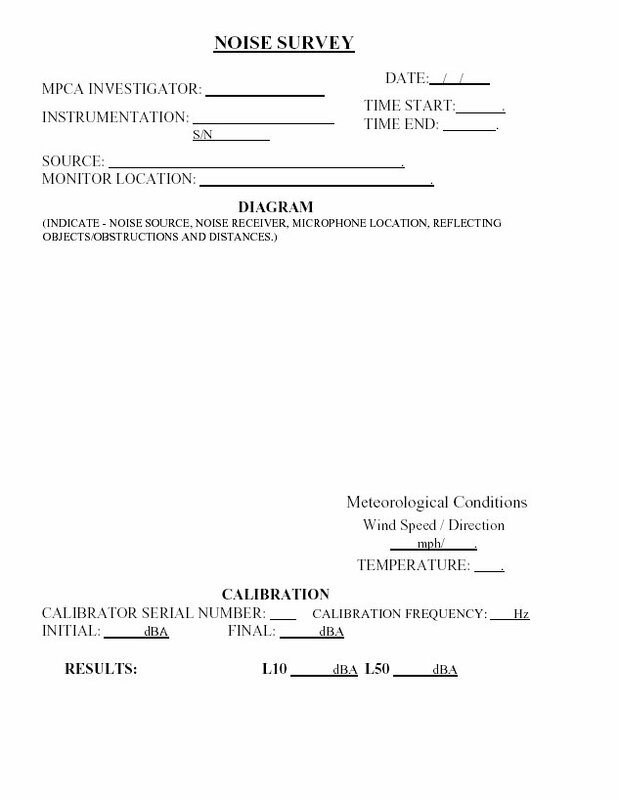 A survey form must be completed containing date, time, location, noise source, wind speed/direction, temperature, humidity, equipment information (make, model, serial #), site sketch with the location of the noise source and measurement location (including appropriate distances), data and calibration information. A sample survey form is on the following pages. Using a hand-held sound level meter, take an instantaneous sound reading every 10 seconds and record on a "sample sheet." An example of a "sample sheet" is on the next page. Continue taking sound readings for one hour, which will give you 360 individual readings. To determine the L10, take the 36th loudest (10% of 360 = 36) individual sound reading by counting from the loudest to the quietest on the "sample sheet." In the example on the next page, the L10 = 63 and is the 36th X from the top of the sheet. To determine the L50, take the 180th loudest (50% of 360 = 180) individual sound reading. In the example, the L50 = 57 and represents the 180th X from the top of the sheet. Several agencies have noise regulations for different noise sources. Noise regulations are either source standards or receiver-based standards. Department of Natural Resources (DNR) - The Minnesota DNR has source standards for snowmobiles, motorboats, personal watercraft and off-highway vehicles. Federal Aviation Administration (FAA) - The FAA has source regulations for commercial jet engines. All commercial jet engines must meet noise emission criteria prior to being certified for flight. Federal Highway Administration (FHWA) - The FHWA does not have actual noise standards, but has guidelines of an L10 of 70 dBA which are used to trip a federal funding mechanism for noise abatement on highway projects. Federal Railroad Administration (FRA) - Regulation of railroad related noise is the responsibility of the FRA. Housing and Urban Development (HUD) - HUD has noise regulations that establish acceptable noise zones HUD housing projects must fall into. Occupational Safety and Health Administration (OSHA) - OSHA has regulations to protect against hearing loss in the workplace. These are "dose standards" that restrict the amount of noise an employee receives over a period of time, such as eight hours. Local Agency - A local governing agency, such as a city, may or may not have an ordinance regulating noise levels. Minnesota Pollution Control Agency (MPCA) - The MPCA has a receiver-based standard intended to limit noise levels and protect the health and welfare of the general public. For the purpose of chapter 7030, American National Standards Institute, Specification for Sound Level Meters, S1.4-1983 is incorporated by reference. This publication is available from the American National Standards Institute, 1430 Broadway, New York, N.Y. 10018 and can be found at: the offices of the Minnesota Pollution Control Agency, 1935 West County Road B-2, Roseville, Minnesota 55113; the Government Documents Section, Room 409, Wilson Library, University of Minnesota, 309 19th Avenue South, Minneapolis, Minnesota 55454; and the State of Minnesota Law Library, 25 Constitution Avenue, Saint Paul, Minnesota 55155. This document is not subject to frequent change. 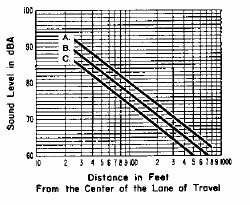 The Federal Highway Administration publication, Sound Procedures for Measuring Highway Noise: Final Report, FHWA-DP-45-1R (August 1981) is incorporated by reference. This publication is available from the United States Department of Transportation, Federal Highway Administration, 1000 North Globe Road, Arlington, Virginia 22201 and can be found at: the offices of the Minnesota Pollution Control Agency, 1935 West County Road B-2, Roseville, Minnesota 55113; the Government Documents Section, Room 409, Wilson Library, University of Minnesota, 309 19th Avenue South, Minneapolis, Minnesota 55454; and the State of Minnesota Law Library, 25 Constitution Avenue, Saint Paul, Minnesota 55155. This document is not subject to frequent change. Subpart 1. Application. The terms used in chapter 7030 have the meanings given them in this part. Subp. 2. A-weighted. "A-weighted" means a specific weighting of the sound pressure level for the purpose of determining the human response to sound. The specific weighting characteristics and tolerances are those given in American National Standards Institute S1.4-1983, section 5.1. Subp. 5. Decibel. "Decibel" means a unit of sound pressure level, abbreviated as dB. 20 Subp. 6. Impulsive noise. "Impulsive noise" means either a single sound pressure peak (with either a rise time less than 200 milliseconds or total duration less than 200 milliseconds) or multiple sound pressure peaks (with either rise times less than 200 milliseconds or total duration less than 200 milliseconds) spaced at least by 200 millisecond pauses. Subp. 7. L10. "L10" means the sound level, expressed in dB(A), which is exceeded ten percent of the time for a one hour survey, as measured by test procedures approved by the commissioner. Subp. 8. L50. "L50" means the sound level, expressed in dB(A), which is exceeded 50 percent of the time for a one hour survey, as measured by test procedures approved by the commissioner. Subp. 11. Person. "Person" means any human being, any municipality or other governmental or political subdivision or other public department or agency, any public or private corporation, any partnership, firm, association, or other organization, any receiver, trustee, assignee, agency, legal entity, other than a court of law, or any legal representative of any of the foregoing, but does not include the agency. No person may violate the standards established in part 7030.0040, unless exempted by Minnesota Statutes, section 116.07, subdivision 2a. Any municipality having authority to regulate land use shall take all reasonable measures within its jurisdiction to prevent the establishment of land use activities listed in noise area classification (NAC) 1, 2, or 3 in any location where the standards established in part 7030.0040 will be violated immediately upon establishment of the land use. Subpart 1. Scope. These standards describe the limiting levels of sound established on the basis of present knowledge for the preservation of public health and welfare. These standards are consistent with speech, sleep, annoyance, and hearing conservation requirements for receivers within areas grouped according to land activities by the noise area classification (NAC) system established in part 7030.0050. However, these standards do not, by themselves, identify the limiting levels of impulsive noise needed for the preservation of public health and welfare. Noise standards in subpart 2 apply to all sources. 7030.0050 NOISE AREA CLASSIFICATION. Subpart 1. Applicability. The noise area classification is based on the land use activity at the location of the receiver and determines the noise standards applicable to that land use activity unless an exception is applied under subpart 3. Other cultural, entertainment, and recreational activities. All other activities not otherwise listed. Other undeveloped land and water areas. A. The daytime standards for noise area classification 1 shall be applied to noise area classification 1 during the nighttime if the land use activity does not include overnight lodging. (3) the building has no areas or accommodations that are intended for outdoor activities. History: 11 SR 43; 18 SR 614 7030.0060 MEASUREMENT METHODOLOGY. Subp. 2. Equipment specifications. All sound level measuring devices must meet Type O, I, II, or S specifications under American National Standards Institute S1.4-1983. Subp. 4. Measurement procedures. The following procedures must be used to obtain representative sound level measurements: A. Measurements must be made at least three feet off the ground or surface and away from natural or artificial structures which would prevent an accurate measurement. site sketch indicating noise source, measurement location, directions, distances, and obstructions. Subpart 1. Purpose. 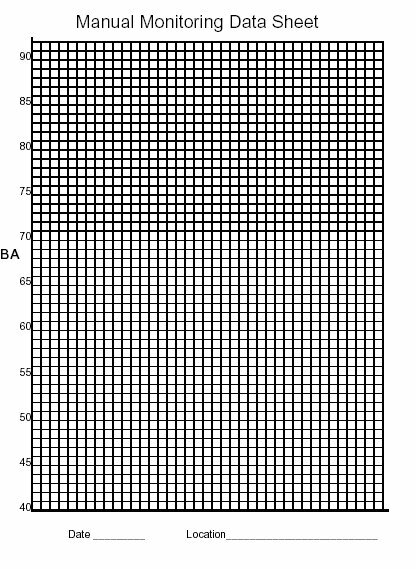 Sound level measurements made for assessing sound attenuation as specified in part 7030.0050, subpart 3, item B, C, or D, shall be made according to the requirements of this part. Subp. 2. Equipment. The equipment shall meet the requirements specified in part 7030.0060, subpart 2. Subp. 3. Calibration. The equipment must meet the calibration requirements specified in part 7030.0060, subpart 3. Subp. 4. Measurement procedure. 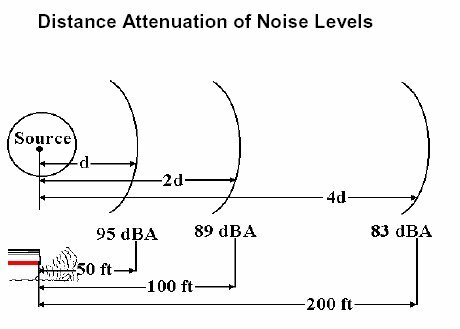 The measurement procedure described in FHWA-DP-45-1R, section 8 must be used for determination of the sound attenuation. Subp. 5. Equivalent methods. Methods equivalent to those described in subpart 4 may be used provided they are approved by the commissioner of the Minnesota Pollution Control Agency. The commissioner shall approve an alternative method if the commissioner finds that the method will produce representative data and results which are as reliable as the methods specified in subpart 4. If, upon written application of the responsible person, the agency finds that by reason of exceptional circumstances strict conformity with any provisions of any noise rule would cause undue hardship, would be unreasonable, impractical, or not feasible under the circumstances, the agency may permit a variance upon the conditions and within the time limitations as it may prescribe for the prevention, control, or abatement of noise pollution in harmony with the intent of the state and any applicable federal laws. "Motor vehicle" means any self-propelled vehicle not operated exclusively upon railroad tracks and any vehicle propelled or drawn by a self-propelled vehicle and includes vehicles known as trackless trolleys which are propelled by electric power obtained from overhead trolley wires but not operated upon rails, except snowmobiles. Subpart 1. Operation of vehicle. No person shall operate either a motor vehicle or combination of vehicles of a type subject to registration pursuant to Minnesota Statutes, chapter 168 at any time or under any condition of grade, load, acceleration, or deceleration in such a manner as to exceed the noise limits contained herein for the category of motor vehicle and speed limits specified, when tested with a measurement procedure approved by the commissioner. Subp. 2. Sale of vehicle. No person shall sell or offer for sale a new motor vehicle or combination of vehicles of a type subject to registration pursuant to Minnesota Statutes, chapter 168 which when maintained according to the manufacturer's specifications would exceed the noise limits contained herein for the category of motor vehicle and speed limits specified, when tested with a measurement procedure approved by the commissioner. Subp. 4. Sale of parts. No person shall sell or offer for sale replacement or additional parts for a motor vehicle or combination of vehicles of a type subject to registration pursuant to Minnesota Statutes, chapter 168 which when installed in the vehicle will amplify or increase the noise emitted by the vehicle, above the noise limits contained herein for the category of motor vehicle and speed limits specified, when tested with a measurement procedure approved by the commissioner. No person shall operate a motor vehicle incorporating such parts. This chapter applies to the total noise from a vehicle or combination of vehicles of a type subject to registration pursuant to Minnesota Statutes, chapter 168 and shall not be construed as limiting or precluding the enforcement of any other provision of law relating to motor vehicle exhaust noise. Vehicles under parts 7030.1050 and 7030.1060 are allowed to exceed the noise limits contained herein when performing acceleration maneuvers for safety purposes. Motor vehicle noise limits for vehicles with a manufacturer's gross vehicle weight rating of more than 10,000 pounds and any combination of vehicles towed by such motor vehicle. Speed limits greater than 35 mph. Speed limits equal to or less than 35 mph and stationary run-up tests (for vehicles with governed engines). For stationary run-up tests on all-paved surfaces, add 2 dBA. Speed limits equal to or less than 35 mph and stationary run-up tests (for vehicles with governed engines), for vehicles manufactured on or after January 1, 1978. For stationary run-up tests on all-paved surfaces, add 2 dBA. Speed limits equal to or less than 35 mph and stationary run-up tests (for vehicles with governed engines), for vehicles manufactured on or after January 1, 1982. For stationary run-up tests on all-paved surfaces, add 2 dBA. For vehicles manufactured before January 1, 1975. 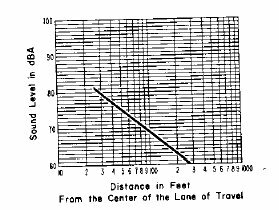 Speed limits greater than 35 mph for vehicles manufactured on or after January 1, 1975. Speed limits equal to or less than 35 mph for vehicles manufactured on or after January 1, 1975. 7030.1060 NOISE LIMITS FOR OTHER VEHICLES. Motor vehicle noise limits for any other motor vehicle not included under parts 7030.1040 and 7030.1050 and any combination of vehicles towed by such motor vehicle. Subdivision 1. Operation in excess of noise limits prohibited. A person may not operate a motorboat under any condition of load, acceleration, or deceleration in a manner that exceeds the noise limits contained in subdivision 2. Subd. 2. Noise Limits. for marine engines or motorboats manufactured on or after January 1, 1982, a noise level of 82 decibels on the A scale measured at a distance of 50 feet from the motorboat or equivalent noise levels at other distances as specified by the commissioner. The noise limits in paragraph (a) do not preclude enforcement of other laws relating to motorboat noise. Subd. 3. Applicability. The provisions of this section do not apply to motorboats operating under a permit issued under section 86B.121 or a United States coast guard marine event permit in a regatta or race while on trial runs or while on official trials for speed records during the time and in the designated area authorized by the permit. Subdivision 1. Exhaust muffling system required. A motor may not be used on a motorboat unless it is equipped with an efficient muffler, underwater exhaust, or other device that adequately muffles or suppresses the sound of the exhaust of the motor so as to prevent excessive or unusual noise. A motor may not be equipped with a cut-out. Subd. 2. Sale of motor that exceeds noise limits prohibited. A person may not sell or offer for sale a new marine engine or motorboat that would exceed the noise limits contained in section 86B.321, subdivision 2, under a test procedure approved by the commissioner if the motor is maintained according to the manufacturer's specifications. Subd. 3. Modification of engine to exceed noise limits prohibited. (a) A person may not modify a marine engine or motorboat in a manner that will amplify or increase the noise emitted by the marine engine or motorboat above the noise limits contained in section 86B.321, subdivision 2, under a test procedure approved by the commissioner. (b) A person may not operate a motorboat with an engine modified to increase noise above the noise limits. Subd. 4. Sale of parts that cause excessive noise. (a) A person may not sell or offer for sale replacement or additional parts for a marine engine or motorboat which when installed in the marine engine or motorboat will amplify or increase the noise emitted by the marine engine or motorboat above the noise limits contained in section 86B.321, subdivision 2, under a test procedure approved by the commissioner. (b) A person may not operate a motorboat incorporating parts prohibited to be sold under paragraph (a). Subd. 5. Applicability. The provisions of this section do not apply to motorboats operating under a permit issued under section 86B.121 or a United States Coast Guard marine event permit in a regatta, or race, while on trial runs, or while on official trials for speed records during the time and in the designated area authorized by the permit. Except as provided in this section, every snowmobile shall be equipped at all times with a muffler in good working order which blends the exhaust noise into the overall snowmobile noise and is in constant operation to prevent excessive or unusual noise. The exhaust system shall not emit or produce a sharp popping or crackling sound. This section does not apply to organized races or similar competitive events held on (1) private lands, with the permission of the owner, lessee, or custodian of the land; (2) public lands and water under the jurisdiction of the commissioner of natural resources, with the commissioner's permission; or (3) other public lands, with the consent of the public agency owning the land. No person shall have for sale, sell, or offer for sale on any new snow-mobile any muffler that fails to comply with the specifications required by the rules of the commissioner after the effective date of the rules. A. No person shall operate a snowmobile unless it is equipped with a muffler as required by law and these rules, except that snowmobiles may be operated in organized events as authorized by Minnesota Statutes, section 84.871, without such a muffler. B. No snowmobile manufactured on or after June 30, 1970, and before February 1, 1972, for sale in Minnesota, except snowmobiles designed for competition purposes only, shall be sold, or offered for sale, unless it is equipped with a muffler that limits engine noise to not more than 86 decibels on the A scale at 50 feet. C. No snowmobile manufactured on or after February 1, 1972, for sale in Minnesota - except snowmobiles designed for competition purposes only, shall be sold, or offered for sale, unless it is equipped with a muffler that limits engine noise to not more than 82 decibels on the A scale at 50 feet. D. No snowmobile manufactured on or after April 1, 1975, except a snowmobile designed for competition purposes only, shall be sold, offered for sale, or operated in Minnesota unless it is so equipped and has been certified by the manufacturer to conform to a sound level limitation of not more than 78 decibels on the A scale at 50 feet as originally equipped. E. In certifying that a new snowmobile complies with the noise limitation requirements of this rule, a manufacturer shall make such a certification based on measurements made in accordance with the SAE Recommended Practice J192(a), as set forth in the Report of the Vehicle Sound Level Committee, as approved by the Society of Automotive Engineers September 1970 and revised November 1973. F. No snowmobile shall be sold or offered for sale in Minnesota unless its maker has previously furnished the commissioner with a certificate of compliance certifying that all snowmobiles made by that maker meet or exceed the applicable noise level restrictions established by these rules. The certification of compliance shall be in the form of a "Snowmobile Safety Certification Committee" label conspicuously attached to the machine showing certification by the Snowmobile Safety and Certification Committee, Inc., or a label showing compliance with Snowmobile Safety Certification Committee standards accompanied by a letter containing test results of an evaluation of noise levels by a competent independent testing laboratory. Snowmobiles intended for competition purposes only shall be exempt from this part provided a separate placard identifying that such snowmobile is not so equipped is conspicuously and permanently affixed thereto. G. Except for organized events as authorized by Minnesota Statutes, section 84.871, no snowmobile shall be modified by any person in any manner that shall amplify or otherwise increase total noise level above that emitted by the snowmobile as originally equipped, regardless of the date of manufacture.